Enriched corn grits (niacin, reduced iron, thiamine mononitrate, riboflavin). For thinner grits, add more more water. For thicker, creamier grits, cook longer. For 1 serving: Combine 1-1/3 cups water and 1/8 tsp. salt with 1/3 cup Dixie Lily Grits in a 1-quart bowl. Microwave at HIGH 4-5 minutes, stirring occasionally. Let stand until desired consistency. His much for the case of 8/5# bags? Thank you so much for contacting us. Unfortunately, we cannot sell directly to the public. You could call Southern Traditional Foods at 251-213-1171 to see if they could sell to you by the case. We hope this helps and we appreciate your business. 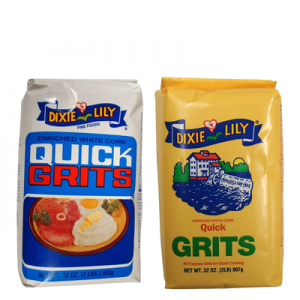 Are Dixie Lilly Enriched white corn quick grits gluten free? Thank you so much for contacting us. Corn is gluten free in nature. However, the only grit product that we sell that is certified gluten free are our yellow grits. Our Quick Grits are not certified because of the chance of trace cross contamination on the farm, storage facilities, packaging facilities or during transport to us, our packages or our suppliers. We hope this helps and we appreciate your business. Are the white quick cook grits gluten free? Thank you. Thank you so much for contacting us. Corn is gluten free in nature. However, the only grit product that we sell that is certified gluten free are our yellow grits. Our Quick Grits are not certified because of the chance of trace cross contamination on the farm, storage facilities, packaging facilities or during transport to us, our packages or our suppliers. We hope this email helps and we appreciate your business. Previous Previous post: Dixie Lily Yellow Corn Grits – Gluten Free!